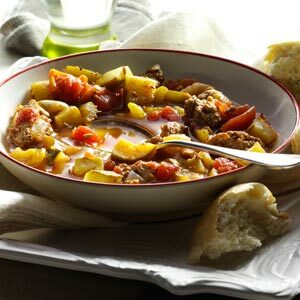 This fresh-tasting minestrone soup gets its zesty flavor from Italian sausage. If your family likes food extra spicy, use hot bulk Italian sausage instead. In a large saucepan, cook the sausage until no longer pink. Remove with a slotted spoon to paper towel to drain, reserving 1 tablespoon of drippings. Saute celery and onion in drippings for 5 minutes. Add sausage and remaining ingredients; bring to a boil. Reduce heat; cover and simmer for 20-30 minutes or until the vegetables are tender. Yield: 9 servings.